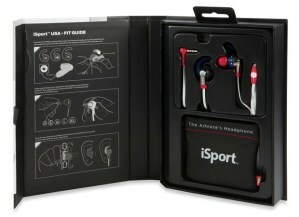 Monster iSport Headphones Review - Should You Throw a Pair in Your Gym Bag? How distracting is it when you go for a run and you can’t keep your headphones from falling out of your ears? Are you like some that has resorted to over the ear headphones to prevent losing control of your headphones? Or tried Basic gym essentials include towels, gloves and of course headphones. I’ve gone through many headphones in my gym career. Face it; they’re not all built to last through rigorous workouts. When buying inexpensive headphones I’d risk good sound quality. But that was the best option since I didn’t expect them to last. Many headphones have tried to aid this problem; but I’ve yet to see any that can. There a few things that you need with your running/workout headphones. You want headphones that can drown out at least some of the noise; gets you in the zone. Durable design is a plus as they’re always being thrown into your gym bag. I don’t know how some athletes go to the gym or run with huge headphones headphones. It’s obviously uncomfortable. It’s so evident that they’re not made to work out with. Constantly adjusting the headband, and the nuisance of the sweat on the ear pads. Yuck. The Monster iSport headphones are looking to be the answer to the problem. The headphones are not only sweat-proof; they claim to be completely immersible. You can imagine how excited I was to try them when I found that out. They also claim to have a perfect fit; where they won’t fall out of your ears; no matter how hard you’re working out. It’s so frustrating when you’re in the middle of a good run, or in the zone and the one of the earpieces falls out. You lose your focus. 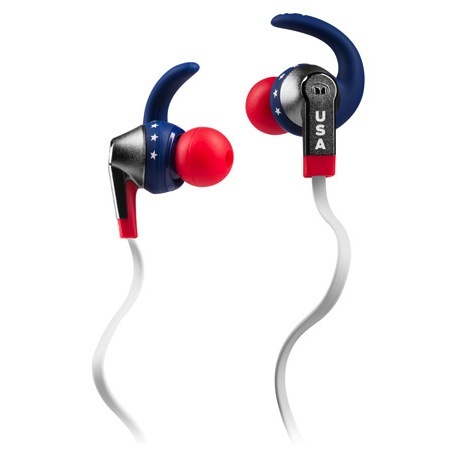 The Monster iSport USA headphones come in red, white and blue. They are mostly plastic. The ear buds and sports clip have a rubber coating. The 3.5 mm jack is L-shaped and gold-plated. The cable is less likely to tangle up since it’s flat. That will hopefully save me a few minutes. I always manage to tangle up my headphones. The important innovation in these headphones is the “OmniTip” swivel nozzle. Monster claims this is what will keep the headphones firmly placed in your ear. Along with the various size sports clips and ear tips, you can work out to max levels with optimum sound. The OmniTip swivel nozzle adjusts to three positions, suiting the placement of the headphones in your ear canal and ear tips. Who would have thought the placement of the tip can determine how well you hear the music (quality). Using the iSport fit guide you’re likely to find the near perfect fit. After messing around with the provided ear clips and tips, I found my perfect fit. The sports clips didn’t bother my ears at all. I thought they would be piercing and uncomfortable. Glad to be wrong about that. Off I went to the gym ready to put them through a tough workout. What I found pleasantly surprising about these headphones is the bass on them. I did no expect that much sound quality from headphones that can be dunked in water. The bass was not all distorted. It was great to drown out the gym’s crappy music. Definitely helped me focus on my workout. They only fell out of my ears once (the right ear); and that was at nearly the end of my workout. They put up quite the fight! As for the ControlTalk, I was happy when it worked on my Samsung Galaxy S III. Usually headphone controls don’t work on Android devices. The ControlTalk also worked on my iPod Touch as expected. It’s used to just answer/end a call or play/pause a track. When I connected the headphones to my Android phone and pressed the ControlTalk button it opened up my Music Player and played the first track of the last album I was listening to. When on a call, I heard the other person clearly. A little too loud and clear. I feel that the ear-tips worked so well, that I might have speaking a little bit louder than my regular speaking level. Buddy Up With the Monster iSport for the Gym? I did not wash my iSport headphones in a washing machine. I did however wash them under running water with soap a few times. They are still working. If they can survive being washed several times; they are more than likely to survive your sweat, tears, rain and snow. Besides being waterproof; the fact that they stay intact is a huge selling point. These headphones are good for running/athletic women because they focus on all ear sizes. Not an uncomfortable fit! They have a hefty price tag of $199; but it beats replacing headphones over and over again. You can get the stock colors of the Monster iSport (blue or black for $99). If music is a really important part of your workout you will see these as a great investment in your athletic career.